When his new album fails to sell records, pop/rap superstar conner4real (Andy Samberg) goes into a major tailspin and watches his celebrity high life begin to collapse. He'll try anything to bounce back, anything except reuniting with his old rap group The Style Boyz. His crisis of popularity leaves his fans, sycophants and rivals all wondering what to do when he’s no longer the dopest star of all. 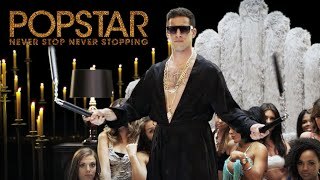 Popstar: Never Stop Never Stopping streaming: where to watch online? You can buy "Popstar: Never Stop Never Stopping" on Vudu, Apple iTunes, PlayStation, FandangoNOW, Google Play Movies, YouTube, Microsoft Store, Amazon Video as download or rent it on FandangoNOW, Google Play Movies, YouTube, Vudu, Apple iTunes, Microsoft Store, Amazon Video online.